Until now we have assumed that exist so-called “labor markets”, ie spaces (not necessarily physical) in which entrepreneurs and workers come together to transact the employment levels and wages in a free and competitive context. Well, now we will criticize this assumption. Are there in the reality free and competitive labor markets? We think that do not, and in this position supports us the institutionalist school. Let us consider its arguments. First we have the phenomenon of collective bargaining and labor unions. Regarding it is interesting to note the context in which it originated labor institutionalist approach. Institutionalist theory of labor markets emerged during the 1940s in the United States at a time when the unions were growing rapidly in the country and centralized collective bargaining was spreading. This prompted some economists to consider that the orthodox theory of wages had ceased to be realistic and relevant. Why? Because the collective determination of wages in the presence of labor unions was very different than the competition. This difference was primarily qualitative and not merely quantitative. And is that unions are institutions primarily political, not economic, which operating in a context of “game of pressure” between the government, employers and workers themselves following a logic of negotiation rather than of optimization. 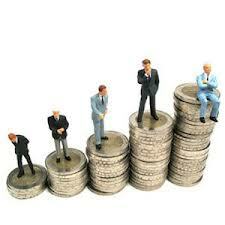 As a consequence of the foregoing, the wage becomes more a administrated wage than a market wage. And in effect, given this context of collective bargaining, the wages turn into the result of conscious human decisions and no longer of impersonal market forces. Or in any case, as the institutionalists say, rather than the wage conforms to the supply and demand of labor, the supply and demand of labor conform to the wage. The second critique from the institutionalist school to orthodox theory of distribution is based on the famous theory of dual labor market. According to this theory, originally raised by Doeringer and Piore (1) - there are two types of well differentiated labor markets: “primary” and “secondary”. Primary labor markets are, by definition, those where the jobs are "good". Its features are: 1) stability and security, 2) high and increasing wages, 3) opportunities for ascents in the scale of positions, 4) utilization of advanced and capital intensive technology, and 5) existence of effective and efficient labor unions. By contrast, secondary labor markets are those where the jobs are "bad". Its features are: 1) instability (because of the high labor rotation), 2) relatively low and stagnant wages, 3) scales nonexistent jobs or with few opportunities for promotion, 4) utilization of outdated technologies and labor intensive and 5) absence or weakness of labor unions. Why this is so problematic for orthodox economics? Simple: because it contradicts that postulate according to which it “proves” the righteousness of capitalist distribution, meaning that to each worker is paid according to his productivity. For if indeed there duality in the labor markets (or, at least, in the most of them) we will find that wages are no longer unique and primarily determined by the productivity of workers but rather by the type of labor market to which they belong (primary or secondary). Perhaps an orthodox economist can object at this point that even accepting the existence of duality in the labor markets is not necessary to deny labor mobility because it may well be the case that a worker pertaining to a secondary labor market increase his productivity and come to the primary market. Obviously this case can be given, and sometimes occurs. But it is the exception, not the rule. And even more so when the features of secondary labor markets are interrelated and feed back each other. In effect, because of the low level of wages paid in this type of market, entrepreneurs have no greater incentive to introduce labor-saving technology and, consequently, the productivity of workers, along with their wages, stagnates (and this to say nothing of the case in which this technology is incorporated but wages do not rise to obtain higher “profits”). And not only that. The presence of a stagnant technology decreases the opportunities and incentives for workers to improve their skills. Therefore, it is not so easy that a worker of these conditions can "climb" to a primary labor market. Finally, the third line criticism of institutionalist is related to the existence of so-called internal labor markets. An internal labor market can be defined as an administrative system of the firm which is regulated by a set of intra-institutional rules and procedures to determine prices and allocations of labor. Thus, according to this approach, even if we accept the orthodox theory of wage setting via supply and demand we would have to say that its validity ends at the door of the company, ie, precisely where this theory should enter. Why? Because of the door inwards the very "universal" and "apodictic" laws of supply and demand are immediately replaced, as we have said, by a series of rules and procedures to fix the positions and salaries of employees. Any economist who has had the opportunity to meet real firms will realize that the existence of these so called internal labor markets is not a mere “bureaucratic anomaly” but rather it is a widespread phenomenon in the organization and enterprise management. The main reason is the need of the companies (especially medium and large) of reducing employee turnover. First, because the costs of recruitment are usually pretty high (not think only the monetary costs) and, secondly, because when entrepreneurs invest in specific qualifications of their workers are aware that they must stabilize the employment for obtain better performance by these investments in human capital. 1. Peter Doeringer y Michael Piore, Internal Labour Markets and Manpower Analysis, Ed. Lexington, 1971.